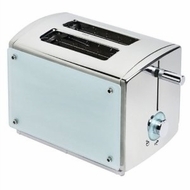 Bring great taste to your kitchen with this stunningly stylish toaster. Housed in lustrous stainless steel with decorative glass sides, you'll be begging to make breakfast. Extra-wide slots (38mm) and a variable browning knob ensure flawless toasting control. Features 3 functions : Cancel / defrost / bagel, with blue indication LEDs. One-year warranty.